In this post Ethan Quillen explores a discursive approach to atheism (and nonreligion) following the theoretical work of von Stuckrad (2003). Quillen suggests that researchers in this area move away from definitions and wrangling over the the meaning of words, and concentrate instead on the way in which these words are used; how these words are made meaningful and allowing research participants to ‘speak for themselves’. Here, Quillen proposes that this discursive approach has methodological implications for research in this field. While admittedly my initial intentions for this post were a bit more malicious—repeating my old standard of arguing against the use of ‘nonreligion’  —I soon felt that to be a bit tedious and wasteful. That is, where in the past I have spent a good amount of time offering a critical perspective on the use of the term, such as was the content of my presentation at the NSRN conference in 2012, for this post I have chosen instead to focus on my own experiences in trying to make sense of the ambiguity, equivocality, and general polyvocal definitions, stipulations, conceptions, and re-conceptions of the term ‘Atheism.’ In this way, I hope to move my usual argument away from that sort of benign criticism—‘I just don’t like it’—toward a more empathetic, yet perhaps still critical, discussion about how I have tried to resolve this issue within the wider context of the study of Atheism and nonreligion. Like many of us, my early introduction to the study of Atheism began with a practical submersion into the theoretical discourse about how scholars have made use of the term, an immersion that left me somewhat disheartened. Again, like many of us, prior to this initial engagement I held a fairly vague notion about what ‘being Atheist’ meant. In many ways it reminded me of those first method and theory courses where, just like with Atheism here, the term ‘religion’ came to embody something far beyond what I had ever assumed—which I take as an apt comparison. Though it at times might seem so, Atheism is not, as Baggini’s Very Short Introduction might state, “extremely simple to define” (2003: 3). Rather, the discourse on defining Atheism is as the discourse on defining religion, only writ small. However, because this is an emerging field, we haven’t yet really come to terms with this reality. We seem perfectly satisfied with the idea that the term might collectively make sense if we just keep stipulating what it means for each and every one of our individual uses. It therefore presently embodies an incessant kaleidoscope of definitions that circle around a central thesis, but never come to a consensual rest. What’s more, many of these offer mere generalizations, or worse, re-conceptualizations in the form of new terminology, such as ‘irreligion,’ ‘unbelief,’ or ‘nonreligion.’ In my own failed attempts I tried to translate this polyvocality into my own stipulation: I applied Baird’s (1971) notions of real, lexical, and functional definitions; I considered taxonomical approaches, such as Bullivant’s (2013) ‘pragmatic definition’ in the Oxford Handbook; and I re-considered polythetic or dimensional definitions—which I did use in a previous master’s dissertation. None of this seemed to work. I still felt as if I was in some way betraying the process by trying to ‘construct’ a definition at all. So I chose not to. During this methodological review I came across von Stuckrad’s (2003, 2010, 2013) discussion of the benefits of a ‘discourse analysis’ in the study of religion, and many of the issues addressed in his work seemed aptly comparable to my own. That is, given the predicament of defining religion, his discursive approach seemed to obviate the ‘need’ to define terminology at all, favoring instead an analysis of the process with which individuals use terms like ‘religion’—or ‘Atheism’—in the development of identity construction. In essence, a discursive analysis is an examination of the way in which a particular use of language is generated, employed, and observed. In this way, the term ‘Atheism’ can be approached the same way as the term ‘religion,’ an ‘empty signifier’ (von Stuckrad 2003: 166) that is then filled with meaning depending on the language used. No longer does this require a ‘definition.’ Now, we can perceive how ‘language in use’ (van Dijk 1997; Fairclough 2003; Gee 2005; Paltridge 2006) provides meaning to the term within particular contexts. In many ways, this discursive approach seems quasi-anthropological in its allowing one’s informants to ‘speak for themselves.’ For my intentions, ‘using’ Atheism in this way, worked quite nicely. From this analysis I was able to create a processual understanding, a foundational interpretation less like a definition, and more an appreciation, about how the Atheists within my data discursively use the term in relation to the scholarly discourse defining it. This methodology, in different ways, has allotted me the freedom from constructing yet another definition, and subsequently both removed my analysis from the ambiguous nature inherent in defining the term, as well as reinforced the ethnographic nature of my intentions. More specifically, though, it has permitted the opportunity to perceive Atheism as a visible or ‘expressed’ identity (von Stuckrad 2003: 263) that, in the coming years, I hope to further explore through data such as fiction, film, art, court decisions, and within immeasurable other discursive fields. To conclude here, I would further argue that what this methodology has equally provided is an approach that seems to alleviate the need for us to stipulate or define terminology for others, either in direct instances, or in a general sense, that also alleviates the need to create pragmatic terms—like nonreligion—under which we might categorize our research interests. This does not, of course, mean that terminology like this ought to be dismissed or outright removed from our conversations. Rather, I would contend that what this type of approach does is eliminate any kind of imputation from these sorts of definitions, so that when we discuss how individuals might define themselves as being nonreligious, Atheist, agnostic, humanist, or any other manifestation that might have once fallen under the category ‘nonreligious,’ they are instead perceived as signifiers imbued with particular language, and are thus representative of those individual’s contextualized intentions. That is, rather than us creating terminology that might assist our research needs in categorizing the way individuals might define themselves, by allowing the discourse of their self-definitions to dictate our term usage, we are likewise allowing these individuals to ‘speak for themselves.’ In my opinion, not only does this offer a larger sense of objective clarity to our research, it also removes us from further benign debates about whose definition of what is more proper, correct, or useful. For example, see the Religious Studies Project’s Roundtable on the subject: http://www.religiousstudiesproject.com/podcast/podcast-studying-nonreligion-within-religious-studies/. See Muller 1888; Aveling 1907 ; Drachmann 1922; Buckley 1987 ; Smith 1991; Kahn 1997; Gordon 2002; Baggini 2003; Reid and Mondin 2003; Hartley 2006; McGrath 2006; Bremmer 2007; Ferguson 2009; Hyman 2009; and Palmer 2010. See Masterson 1965; Fabro 1968; Herrick 1985; Buckley 1990; Smith 1991; Pasquini 2000; Gordon 2002; Baggini 2003; Converse 2003; Reid and Mondin 2003; McGrath 2005; Ferguson 2009; Hyman 2009, 2010; and Ledrew 2012. See Aveling 1907 ; Maritain 1949; Masterson 1965; Edwards 1967; Fabro 1968; Robertson 1970; Stein 1980; Smith 1989, 1991; Martin 1990, 2007a, 2007b; Hiorth 1995, 2003; Baggini 2003; Eller 2004, 2010; Cliteur 2009; Hyman 2009; Palmer 2010; Walters 2010; Bullivant 2011, 2012a, 2012b, 2014; Hartley 2006; and Quack 2012. Clifford, James E. and George E. Marcus, eds., Writing Culture: The Poetics and Politics of Ethnography (Berkeley: University of California Press, 1986). Ellis, Carolyn and A. P. Bochner, “Autoethnography, Personal Narrative, Reflexivity: Researcher as Subject” in N. K. Denzin and Y. S. Lincoln, eds., Handbook of Qualitative Research, 2nd ed. (Thousand Oaks, CA: Sage Publishing, 2000). Fairclough, Norman, Analysing Discourse: Textual Analysis for Social Research (London: Routledge, 2003). Gee, James Paul An Introduction To Discourse Analysis: Theory And Method, 2nd edition (London: Routledge, 2005). Geertz, Clifford Works and Lives: The Anthropologist as Author (Stanford: Stanford University Press, 1989). McEwan, Ian Black Dogs (London: Vintage, 1998). Deborah ed., Auto/Ethnography: Rewriting the Self and the Social (Oxford: Berg, 1997). Roberson, David G. “Metaphysical Conspiracism: UFOs as Discursive Object Between Popular Millennial and Conspiracist Fields” (PhD Thesis, The University of Edinburgh, 2014). Stuckrad, Kocku, “Discursive Study of Religion: From states of the Mind to Communication and Action” (Method and Theory in the Study of Religion, Vol. 25, No. 1, 2003). Von Stuckrad, Kocku, “Reflection on the Limits of Reflection: An Invitation to the Discursive Study of Religion” (Method and Theory in the Study of Religion, Vol. 22, 2010). Von Stuckrad, Kocku, “Discursive Study of Religion: Approaches, Definitions, Implications” (Method and Theory in the Study of Religions, Vol. 25, No. 1, 2013). 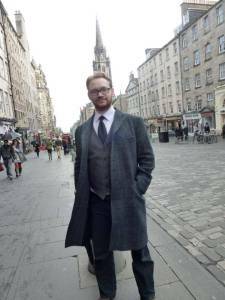 Ethan G. Quillen is a doctoral candidate in religious studies at the University of Edinburgh. His thesis centers on the border between aesthetic and ethnographic fictions and the precarious ability of reading the former as the latter. By using two novels by Ian McEwan as unique auto-ethnographic sources on the concept and discursive representation of Atheism, his thesis equally challenges the normative notion of authenticity and authority habitually assumed in scientific or objective texts. He earned a Bachelor of Arts from the University of California, Riverside in religious studies and a Master of Arts from California State University, Long Beach with an emphasis on 19th century American religious communities and New Religious Movements. He also holds two Master of Arts degrees from Baylor University – the first in American Studies, and the second from the J.M. Dawson Institute of Church State Studies, the latter focused on the ‘legality’ of Atheism under the First Amendment of the United States Constitution. This entry was posted in Methods and Methodologies, NSRN Blog, Reflections from the field, Research Questions and tagged Atheism, discourse analysis, Ethan Quillan, nonreligion. Bookmark the permalink. Thanks, Joseph. I enjoyed your article. Polysemitic terms are quite intriguing, as you equally found. It’s sort of like the nominal vs. virtual distinction between the ‘meaning’ of the word and how the word is used. Likewise, it’s always great to read similar thinking ideas. It reminds me I’m not the only crazy person (at least about this subject) out there.